Since graduating with an honours degree in Business Management & Masters in Financial Management in 2010 Adam began working in his family organisation (Chorley Group – Motor Industry ) in the role of Sales & Marketing Director, overseeing group operations & strategy. Whilst under Adam’s stewardship Chorley Group has continued to grow into one of the North’s most successful businesses, revolutionising the motor industry through disruptive approaches to marketing and employee engagement. The Chorley Group continued to grow and Adam has now played a key role in overseeing their diversification into commercial / residential property development, design, marketing services and most recently professional services. Adam acts in an operational directors role overseeing brand and culture development within CG sitting on the senior board, along with his wife & co-founder Stacey, his Father, Andrew & co-founder Louise Myers. 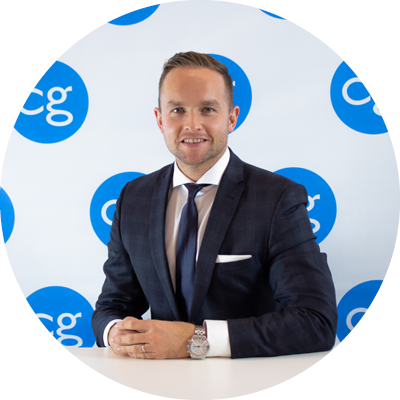 A key focus for Adam within the CG board is ensuring the business continues to grow and develop in a strategic and consistent manner, working closely alongside the team in recruitment and client additions. Adams business experience is a key part of the operational activities within CG, ensuring the team can continue to deliver commercially relevant advice in a manner that commercial clients require. An obsession with delivering excellent customer service drives Adam in all industries and this is evident within CG.